I feel very defensive towards noctilucent clouds. At times, they seem to play the role of the aurora's frumpish sister. It's not uncommon for folks on social media in the middle of summer to yearn for the end of NLC season, the return to dark skies, and the chance of that spectacular view of the northern lights. Don't get me wrong. I love a good aurora show as much as the next person. I just happen to love the short season of noctilucent displays. Maybe it's something to do with the fact that during the never-ending summer twilight, when you're out chasing the NLCs, you can get away with wearing a t-shirt and light jacket, being as mild as it is. Maybe it's something to do with the mesmerizing light displays they can put on, as their wave-like structures undulate and ripple across the twilight sky. Maybe it's something to do with the fact that they are largely unappreciated, and that being into them is kind of like being into that cool band just before everyone else realises how cool they are and they go stratospheric - or should that be mesospheric (*meteorologists' pun alert)?!? Maybe it's something to do with the mind-blowing nature of the phenomenon itself. These clouds are seeded by the dust of meteors, billions of years old, a kind of atmospheric last hurrah as they go out with a glorious visual bang. They are the highest clouds that form, found at about 85 km high, so thin and ephemeral that they can only be seen in the semi-darkness of twilight, when they are lit from below by the sun that has already set. Whatever it is, when I get a hint that a display is on the cards, I'll set off, usually very late and night and into the wee small hours of the next morning, chasing the clouds, snapping away - and enjoying every last moment of it. The first display I saw was 11 June 2014. I first caught glimpse of it just after midnight. The display itself was quite understated, but it was my first of 2014 and it marked the first time I did a time lapse video of the clouds. And I was pleased to have the season kick off! I had to wait just over a week until the next display. But what a display it was! Again, it started around midnight, again quite understated at first. This time I headed to Carrickfergus Castle where I shot another time lapse until around 1.00 am or so. The display started to fade a bit. But, around 2.00 as the sun slowly crept back up towards the horizon, the display took off again, this time even more impressive than earlier. Nearly half the sky was covered in the most stunning display of glowing tendrils and ripples, all set against the blues and oranges of the encroaching dawn. This is without doubt the best NLC display I have seen to date - and well worth the near all-nighter I pulled to watch the whole thing! A small display on 29 June was next, with the NLCs being quite low on the horizon and partially obscured behind some clouds. The foreground this time was West Bay, Portrush and I managed another short time lapse. A couple of days was all I had to wait until the next display. This time it didn't start until around 2.00 am. I had been spending the previous hour or so photographing in some low mist around the Bush River flood plain. The sky above was mostly clear - a classic summer twilight - but it was well past midnight and no sign of the NLCs. Above the lower cloud on the horizon was what I suspected was just some cirrus cloud. But, around 2.00 am, these clouds began to glow and take on that unmistakable electric blue hue of the NLCs. This was the first time I have seen NLCs gradually appear in the sky, increasing in brightness as the sky around me got darker, and it was a compelling sight to behold. 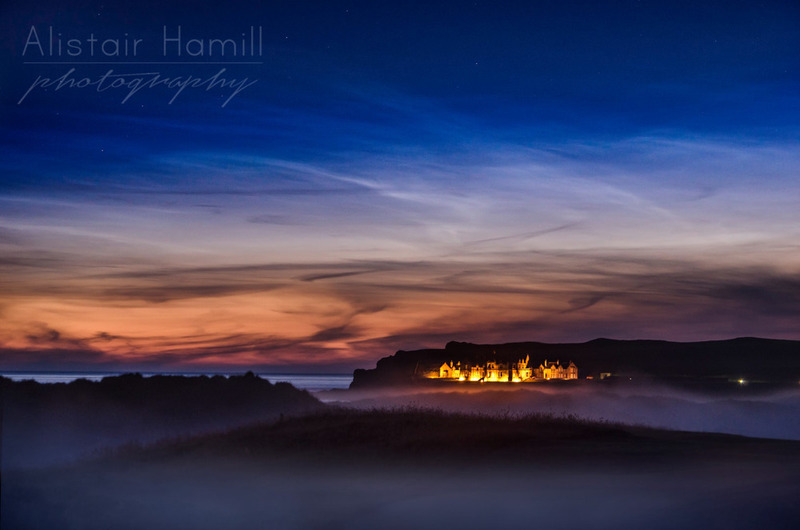 Indeed, over the next few weeks there were further NLC displays, the kind that would have provided the perfect backdrop for Dunluce. But there was always lower cloud in Northern Ireland when they were happening, obscuring our views! We were left with viewing them vicariously through the photos of fellow NLC chasers in Great Britain. But, eventually, there was one last display on a clear night. As well as Dunluce, I had a series of other places I wanted to shoot NLCs at on my list, so without delay I set out on a North Coast road trip, starting at Dunluce of course, going via the Giant's Causeway, and ending up at Ballintoy. Snap, snap, snap, tick, tick, tick! And so, NLC season 2014 comes to an end. Aurora watch 2014/15 begins in earnest. I am, of course, tremendously excited at the prospect of this. But I am equally glad to have had such a great few months searching then twilight skies after midnight to see if anything was stirring. And if you missed them this year, perhaps next year you'll lift your eyes to search for the light show put on by the billion year old dust and microscopic droplets of water, painted across the last canvas of the atmosphere before it transitions into the vacuum of space itself. And perhaps you'll fall in love with them too. During the 2014 season I came across photos of NLCs taken from a slightly unusual angle - from side on, courtesy of view out the window of the International Space Station. These stunning images were taken by Alexander Gerst, an astronaut in the ISS, and they show just how high up 85 km really is! When we say NLCs form in the last part of the atmosphere before space begins, these images show that in very striking form!